For the first time since July 2007, the Bank of England has raised interest rates, by 0.25%. 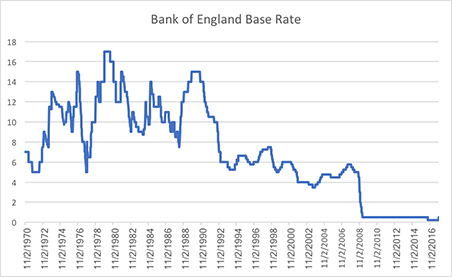 The base rate in the UK now stands at 0.5%. This was very much expected by markets with a probability of over 90% for this to happen. The vote in favour to raise rates was 7 – 2 from the Bank of England’s Monetary Policy Committee, reversing August 2016’s reduction after the Brexit vote. The Bank of England has been very nervous that inflation has crept up and is now at 3%, over 1% above their target. Many commentators feel that their reasoning runs deeper than this with low interest rates almost regarded as representing a moral hazard. With interest rates at such low levels, the UK public has been discouraged from saving and, with borrowing so easy, this could be encouraging people to take on more debt, taking advantage of favourable lending rates now, without thinking about their liabilities in the future. The reality is that we have moved from what was an emergency rate to a still incredibly low level. The graph above illustrates just how low interest rates are compared to history. None of the fund managers True Potential work with see this as a significant move. The Bank of England will only raise rates when they feel the UK economy is strong enough to withstand a rate rise and will do so in a slow, controlled manner that is well communicated to the market. They key question for investors is – are we starting a tightening cycle? To forecast moves in rates is very difficult the further out you look. However, the rhetoric coming from the Bank of England is not indicating a further hike over the short term indeed their forecasts are currently looking at two more rate rises over the next three years. For investors, the key is to be aware of their whole financial position. Interest rates are likely to stay at exceptionally low levels and inflation will erode away the real value of cash deposits at current levels. When the financial crisis hit in late 2007, the average Cash ISA account paid interest of 5.5% a year. By the middle of this year, ISA rates had fallen to record lows, paying 0.82% p.a. on average. Interest rates are less correlated to savings rates in this environment and until lenders start to compete for savers’ funds again, an improvement on the above rate is not a certainty. Currency markets have, initially, been the main markets to react with Sterling falling around 1% compared to the US Dollar. In tomorrow’s Economic Commentary, we will give you a full breakdown as to how markets have reacted. The key is to look for a dependable, diversified investment solution such as the True Potential Portfolios that work in all market conditions. There has and there always will be uncertainty, however, diversification is proven to reduce risk. The True Potential Portfolios offer Advanced Diversification, a new higher level of diversification around fund manager style and a way to guide your investments through all market conditions.